Tom DiGiovanni's job as chief financial officer for Canndescent involves managing bags of cash by the millions which must be counted, then hauled in armored vehicles. "Over the course of a month, we probably have $2 million in cash that's in some state of transit," he says. By the end of the year, that's expected to top $4 million, which will mean more armored vans and heavily armed guards. "They have an ankle holster and another one in the small of their back and they're wearing tactical gear," DiGiovanni says. "It's pretty crazy." DiGiovanni looks like he could be Ray Liotta's brother, with a nightclub bouncer's build. He says he likes living on the edge — at least businesswise. That's good, since aspects of his job feel more akin to gangster than pencil pusher. Marijuana is legal medically or recreationally in 34 states, but it's still illegal under federal law. And though many businesses have entered that new gray market, the financial services industry has not. No major U.S. banks will open accounts for a company like Canndescent or its retail clients. 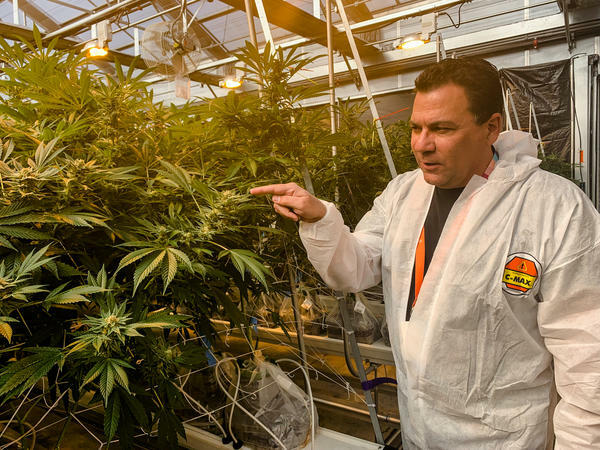 Banks won't lend to the cannabis industry, so much of the money Canndescent used to build its 27,000-square-foot grow house came from friends and family of the owner. 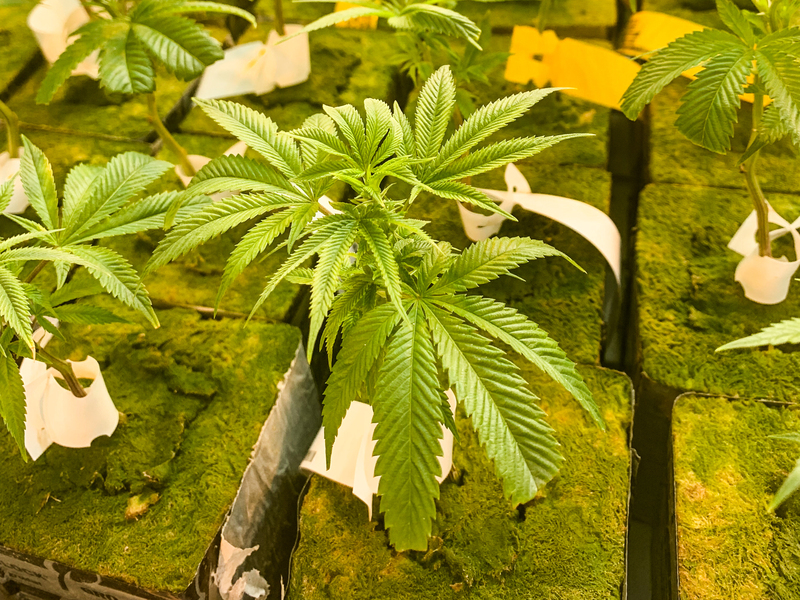 Last month, the House Financial Services Committee advanced legislation that would authorize banks to serve the cannabis industry. Anti-cannabis groups oppose the bill, and legalization generally. They argue the legal trade is a threat to public health that outweighs the tax benefits. The measure has 157 bipartisan co-sponsors so far. But until it passes the full House and Senate, every aspect of DiGiovanni's job will be fraught with added risk and costs — from getting insurance, to paying employees, to filing taxes. The estimated 300 U.S. financial institutions that serve the pot industry are small, state-chartered banks or credit unions. They're audited frequently, and transactions are monitored closely for suspicious activity. A cannabis business pays thousands in monthly fees just to have an account. After scouring the state looking for a credit union to work with, DiGiovanni found one willing to deposit his marijuana revenue. But about every week, he gets calls from retail clients looking for a way to bank, because their accounts were shut down. Banks also won't lend to the industry because if the federal government were to seize a company's assets, the lender would have nothing to collect on the loan. DiGiovanni says the risk of that is extremely low. Yet that fear makes everything harder to access. He's been turned down by payroll companies, human-resource software firms and insurance brokers. And, because of the extra risk, everything costs more. Canndescent invested $200,000 in an automated weighing machine that makes packaging six times faster, for example. The interest rate was 18 percent, or nearly three times the normal rate. Canndescent grows and sells premium pot to retailers throughout California. Most of them pay for the goods in cash. Two years ago, an infection destroyed Canndescent's hydroponic beds of seedlings. But crop insurance wasn't available for marijuana, so the company ate the $600,000 loss. Most financing for cannabis businesses come from individual investors. Canndescent built its 27,000-square-foot grow house in Desert Hot Springs, Calif., largely with money from friends and family of the founder. Meanwhile, sales keep growing, which means dealing with the headache of handling more cash — most of it in $20 bills. Counting all of that money is a pain, and it's heavy. DiGiovanni employs workers to do just that. "It's three or four hours a day that they're standing in front of that machine, feeding cash into it," he says. And it must be counted three times, at an undisclosed location, after every transfer — a process we're not allowed to see. "It gets transported again on a random schedule to our processing facility, which is in a different city that I won't name," he says. Safety is one primary argument in favor of legalizing banking for the industry, says Alyson Martin, co-founder of news site Cannabis Wire. "Because these are essentially cash-only businesses, they become sitting ducks for robberies, thefts and those sorts of things," she says. Banking is the industry's biggest challenge, she says. "I don't think I've talked to anybody who hasn't had banking headaches." DiGiovanni says he thinks the legislation will eventually pass and that will change things for the company. He says better access to banks would help him grow the business faster and hire more. And, in the long run, raise even more tax revenue for the government. But until then, he'll continue moving piles of cash about in bulletproof vans under a blanket of secrecy. Normally a chief financial officer's job involves poring over balance sheets and bank statements. It's a bit different in the cannabis industry. Business is still conducted largely in cash because under federal law, the drug remains illegal. Last month, a House committee advanced legislation that would authorize banks to serve legal marijuana businesses. 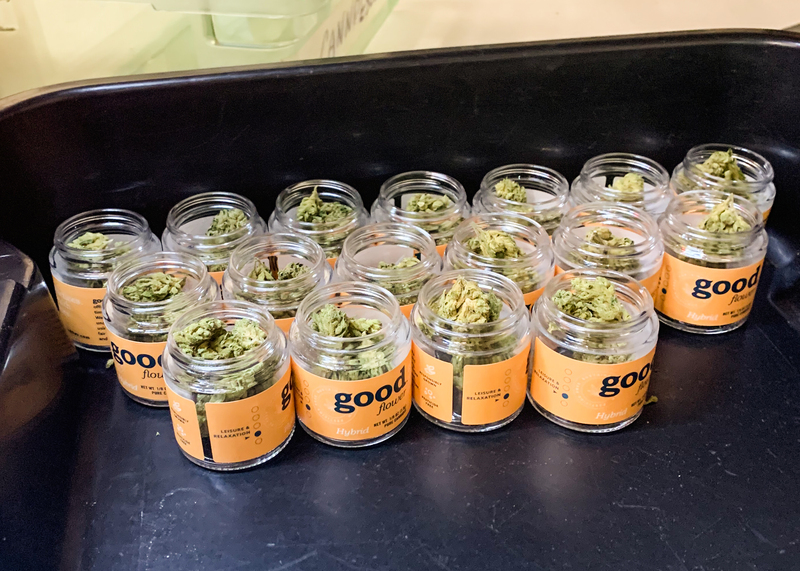 For now, managing a pot business in the 34 states where marijuana is legal requires some creative workarounds, as NPR's Yuki Noguchi reports. YUKI NOGUCHI, BYLINE: Tom DiGiovanni spends his time trying to figure out how to move money to run his business - loads of it. DiGiovanni is a former Ernst & Young accountant and a family man, but now his job feels a lot more gangster than pencil pusher. DiGiovanni looks like he could be Ray Liotta's brother with a nightclub bouncer's build. He says he likes living on the edge at least businesswise, and that's how he ended up here, leaning into an unmarked armored van. NOGUCHI: That metal cage - it's to protect cash from would-be thieves. This is how you transfer money at Canndescent, an organic pot producer in Desert Hot Springs, Calif., under the watchful gaze of big men carrying lots of guns. DIGIOVANNI: May have an ankle holster and, like, you know, another one on the small of their back, and they're wearing tactical gear. It's pretty crazy. NOGUCHI: They safeguard bar-coded bags carrying mostly $20 bills. DIGIOVANNI: Over the course of a month, we probably have $2 million in cash that's in some state of transit. NOGUCHI: Counting all of that is a pain, and it's heavy. He has full-time workers doing just that. DIGIOVANNI: It's three or four hours a day that they're standing in front of that machine, feeding cash into it. NOGUCHI: It's counted three times after every transfer at an undisclosed location. That process, he says, we're not allowed to see. DIGIOVANNI: And it gets transported again on a random schedule to our processing facility, which is in a different city that I won't name. NOGUCHI: The legal marijuana business operates in a murky financial world without help from major banks. Candescent, for example, is four years old and built its grow house largely with money from friends and family of the founder. DIGIOVANNI: This is 27,000 square feet total of grow. NOGUCHI: The estimated 300 financial institutions that serve the pot industry are small state-chartered banks or credit unions. They're audited frequently, and transactions are monitored closely for suspicious activity. A cannabis business pays thousands in monthly fees just to have an account. DiGiovanni found one after scouring the state, looking for a credit union willing to deposit his marijuana revenue. DIGIOVANNI: It's on the Controlled Substances Act, so that makes us a trafficker. NOGUCHI: Banks will not lend to the industry because if the federal government were to seize a company's assets, the lender would have nothing to collect. DiGiovanni says the risk of that is extremely low, yet that fear affects nearly every aspect of his job, from getting insurance to paying employees and finding accountants. As a result, everything costs more, including a $200,000 automated weighing machine that makes packaging six times faster. DIGIOVANNI: It's accurate to one-hundredth of a gram, and I call it the weed robot. NOGUCHI: The interest rate on the loan for that robot cost about triple the normal rate. And that's not all. Two years ago, an infection destroyed Candescent's hydroponic beds of seedlings. But crop insurance wasn't available for marijuana, so the company ate the $600,000 loss. DIGIOVANNI: We've been turned down by three different payroll companies who won't service this industry. NOGUCHI: And yet the IRS collects tax revenue from the industry, an ironic legal twist in DiGiovanni's eyes. DIGIOVANNI: And I can tell you the IRS is more than happy to take a check from a cannabis company. They're more than happy to take a bag of cash. They're more than happy to collect that tax revenue. NOGUCHI: Last month, a House committee approved a bill that would legalize banking for pot businesses. It has 157 bipartisan co-sponsors so far. Anti-cannabis groups oppose the bill and legalization generally. They argue the legal trade is a threat to public health that outweighs the tax benefits. But Alyson Martin says there are safety reasons to legalize banking for the industry. ALYSON MARTIN: Because these are essentially cash-only businesses, they become sitting ducks for robberies, thefts and those sorts of things. NOGUCHI: Martin co-founded the news site Cannabis Wire. She says banking is the industry's biggest challenge. MARTIN: I don't think I've talked to anybody who hasn't had banking headaches. NOGUCHI: Tom DiGiovanni says he thinks that will change soon. He says better access to banks would help him grow the business faster and hire more and, in the long run, raise even more tax revenue for the government. But until then, he'll continue moving piles of cash about in bulletproof vans under a blanket of secrecy. Yuki Noguchi, NPR News. Transcript provided by NPR, Copyright NPR.